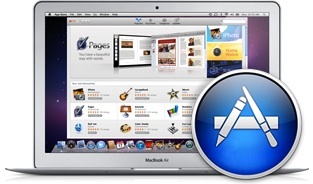 Update: The Mac App Store and Mac OS X 10.6.6are now available through System Update. You can also Download Mac OS X 10.6.6 Directly and the updaters include the Mac App Store. The Mac App Store will feature the same one click purchase and install process that has been widely popularized on the iOS App Store. Apple goes on to say that purchased apps will be able to run on all of your personal Macs, and updates to these apps will be delivered through the Mac App Store. The Mac App Store will run on Mac OS X 10.6 Snow Leopard (and beyond) and will be available to users as a free download through Software Update. You can read the full press release from Apple. That probably means 10.6.6 will be avail. in about 3 weeks. « Will the next MacBook Pro get Quad-Core Sandy Bridge chips?